Sometimes things disappear and there’s no getting them back. 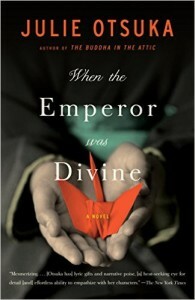 This first novel from Julie Otsuka deals with the period of time that follows her second novel. The Buddha in the Attic told the story of the Japanese American experience from arrival in California at the turn of the century until the forced deportation of Japanese Americans to internment camps during WWII. When the Emperor Was Divine tells the story of one family, from the days just preceding their departure from California to a camp in Utah until their return home. As with The Buddha in the Attic, Otsuka does not give us named characters. The family — a mother, father, daughter and son — remain anonymous, and their experiences are generalized enough that they could be called a sort of representation of the overall Japanese American experience of WWII. Yet, Otsuka demonstrates in this debut her ability to use specific detail to great emotional effect. Without knowing intimate details of her individual characters’ lives, we can nonetheless feel their fear and anxiety, their alienation and sadness, and the horrible injustice of the evacuation, internment and its aftermath. The novel begins with the mother, 41 years old, meticulously preparing for evacuation. She takes care in dressing herself to go shopping, picking up some necessary items for their departure. She is exceedingly polite despite the distasteful things she must do (and some of the actions she takes before evacuation are shocking). Her son, age 8, and daughter, age 11, continue with school until the day before departure. After the arrest of the father in December 1941, the mother began destroying anything that could incriminate them: letters from Japan, photos, kimonos, etc. The family have packed up all they can take, hidden the important things they wish to save, and have locked the house. They don’t know where they are going to be sent or for how long. They also are not sure exactly where the father is. Letters from him are heavily redacted, but he seems to be imprisoned somewhere in New Mexico. Otsuka provides plenty of facts about the internment and a genuine education for the reader. While I had known that Japanese Americans had been sent to camps, I didn’t know, for example, that after leaving their homes but before being shipped east, those in San Francisco were “housed” at a race track and slept in horse stalls. I was not familiar with conditions in the camps, the extremes of cold and heat, the dust storms. I did not know that adults were recruited to help with the harvest, that young men were recruited by the military, or that everyone age 17 and older had to swear allegiance, obedience and loyalty to the United States or face deportation. I had no idea what happened to people’s property during internment or how Japanese Americans were treated upon their return at the end of the war. While all of this factual information is a revelation, the power of Otsuka’s novel is it’s emotional punch. The effect of this unjust deprivation of liberty, property and happiness upon the family and the larger American community is a great moral shame. Much of the novel is told from the points of view of the mother and the son. The mother’s efficiency in preparation for departure masks a fear and depression over the loss of her husband and their home. The boy worries about his father, has horrible dreams, and thinks of the friends he has left behind. When the war ends and Japanese Americans are allowed to leave the camps for home, they are given train fare and $25 each, the same amount given to released prisoners. When the family get to their home, it has been ransacked. Even the mother’s rose bush is missing from the yard. No one in the neighborhood welcomes them back or acknowledges they were even gone. They had seen us leave at the beginning of the war, had peered through their curtains as we walked down the street with our enormous overstuffed suitcases. But none of them came out…. None of them waved. Now when we ran into these same people on the street, they turned away and pretended not to see us. Some neighbors are polite, if not kind, but others become threatening and violent toward Japanese Americans, setting fire to their property or throwing bottles through windows. Otsuka acknowledges that many American fathers never came home from the war, and the newspapers were starting to describe the horrors of American POWs in Japanese camps. We looked at ourselves in the mirror and did not like what we saw: black hair, yellow skin, slanted eyes. The cruel face of the enemy. The mother finally finds work as a maid and takes in laundry for extra money. The father comes home much later from his camp, over four years after his arrest in 1941. He is a broken man; he has lost his hair and his teeth. He never speaks of what happened to him after his arrest or in the camp. He has trouble sleeping and cannot work, eventually he has trouble leaving the house. The final chapter of the novel, called “Confession”, is a brief look into the father’s mind, and it is a punch to the tear ducts. It’s tempting when we think of the US and WWII to focus on the greatest generation and their sacrifices. There’s no denying they performed amazing and selfless acts for our country, and subsequent generations owe them a debt of gratitude. But it is a mistake to overlook our own acts of racism and betrayal toward a group of innocent Americans — Japanese Americans. Julie Otsuka’s two novels are a revelation, beautifully told. They contain a sadness and wisdom that I hope would lead to self-reflection and a resolution to never let such things happen again. It’s a message we need now more than ever. Share the post "Our Shame and Dishonor"